“When you have an individual on video, it really does enhance your ability to put criminals in jail,” Mayor Kasim Reed said. The mayor said the new surveillance program will protect the city better and put away more criminals. Police already used the cameras to set their sights on the DragonCon parade through downtown over the Labor Day weekend. 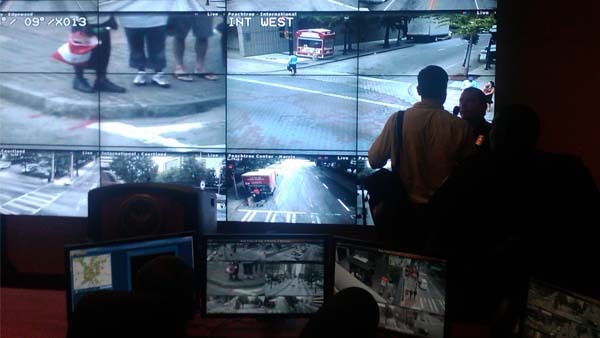 Mayor Reed hopes to expand the system and link up thousands of cameras, not just on downtown streets but all around town at places like Georgia State University and businesses like the Publix supermarket in Buckhead. Privacy advocates said, however, the new system could invade personal liberties. Max Schneider is for more surveillance as long as it’s used to fight crime and not single out innocent citizens. “It gives me the creeps a little. It can make things safer. But I’m not sure if it’s going to be used correctly,” Schneider said. The city and the police foundation have pitched in a half million dollars each for the surveillance system. The state granted another $1.2 million. Officials said discussions are being held to link up with even more cameras at CNN Center, Georgia State University, the Georgia World Congress Center and MARTA, along with cameras in the Buckhead area.